While Queen Elizabeth was still a princess, Albert Wheatley met an engineering friend who as looking for a manufacturer of buttons for a raincoat that was about to be marketed. Mr Wheatley thought he could do the job. He won the work, created the moulds, bought the machinery and, in 1952, began button production in the garage of his house at Heaton Moor, Stockport. The raincoat in question was the hugely successful Pacamac, which became a huge success and proved to Wheatley’s judgement correct. After three years, the volume of work persuaded him to move production from his garage to Reynolds Mill in Stockport’s Newbridge Lane. 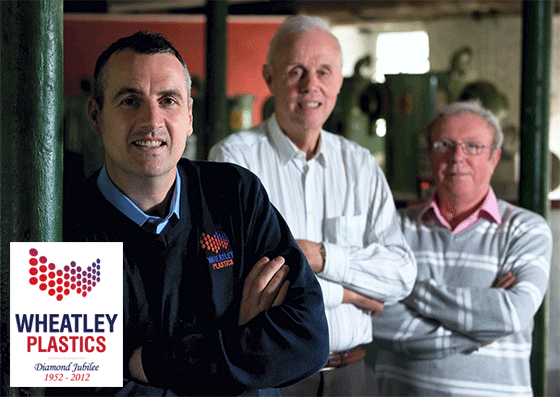 Soon, toys, packaging and electronic components joined buttons as the Wheatley machines were busy meeting orders from all over the UK. As the Swinging Sixties hit their stride, Wheatley Plastics found itself meeting massive demand from Cheadle-based James Galt and Co to produce the toymaker’s building set Playplax. After a 30-year gap, the company is now back manufacturing Playplax, which has been revived by a Hampshire-based toy company, Portobello Games. According to those who knew him, Mr Wheatley took an unorthodox approach to business. He took very little money out of the company, never borrowed from the bank, drove a mere 2,000 miles a year in search of business and only raised prices when the firm started making a loss. When Ian Bell agreed to buy the company from Mr Wheatley in 1972, a new era of 24-hour production was ushered in. Productivity increased and the company invested as much available cash as possible to stockpile materials to combat the ravages of escalating 1970’s inflation. Cheap labour costs in Asia led to much toy production moving abroad in the 1980’s and 1990’s but Wheatley Plastics continued to thrive. Automotive parts and polystyrene products ensured continued success. Rod Harper arrived in the mid-1980’s, became sales manager and eventually managing director before buying the company from Mr Bell in 1990. Following a management buy-out in 2011, Gary Knight became the new MD. He is confident of sales totalling in the year to May 31 being 15-20% up on last year’s £560,000. Gary Knight, who arrived at the firm as a tool setter 15 years ago, added: Things have certainly changed from how things were decades ago. Nowadays, issues such as health and safety and other personnel matters have risen in importance. But in some ways things have returned to how they were. From the 1980s, much of the toy industry went to the Far East as it was labour intensive and the UK could not compete on costs. But it is steadily coming back as British manufacturing is making a comeback!